Alzheimer's disease is not a normal part of aging. It is a progressive and fatal brain disease that is the most common form of dementia. Unfortunately, it is fast becoming one the greatest medical challenges facing Americans. 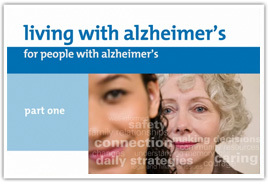 Alzheimer's disease is the 6th leading cause of death in the United States. There are an estimated 5.3 million Americans living with Alzheimer's today. The entire family is impacted; there are an estimated 10 million family caregivers today. If interested, please click on the Log in/Register at the top of the webpage and then enroll for free courses. You will be able to print a certificate and transcript upon course completion. You must register before you are able to enroll in any courses. 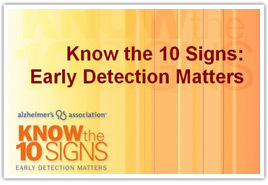 Learn about the ten warning signs of Alzheimer's disease. 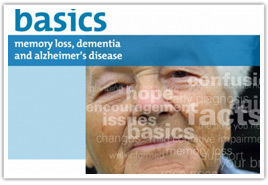 Learn about the difference between Alzheimer's and dementia, stages, risk factors and more. Hear from others directly affected and learn what you can do to cope with the changes that come with an early-stage diagnosis. The Alzheimer's Association also offers individual certification to recognize those who complete the program and demonstrate knowledge of quality dementia care practices. Please see the essentiALZ Certification Program for details. The Alzheimer's Association was formed in 1980 and is the leading voluntary health organization in Alzheimer's care, support and research. Their mission is to eliminate Alzheimer's disease through the advancement of research; to provide and enhance care and support for all affected; and to reduce the risk of dementia through the promotion of brain health.